Baking for folks is a great way to show appreciation. Have you baked for anyone lately? Tell me what you made and who it was for in the comments on this post! Do you remember being a kid in the fall? I remember wearing my brother’s hand me down jacket, pulling the hood up over my head to block out the wind, and me and my sister would rake up every leaf we could find into a huge pile and then spend the day jumping in it, burying ourselves in them, and raking them up again once the pile was depleted from all of our antics. You can sure bet our neighbors didn’t have any stray leaves hanging around their yard when we were done! I always looked forward to Mama getting out our fall clothes because that meant a fresh crop of my brother’s flannel shirts from the year before were handed down to me. I’d rather have an old worn flannel shirt than a new one any day. The soft worn flannel and slightly too large size were like being wrapped up in a hug from sun up until we were called back into the house at supper time. Most of my childhood was spent wearing my brother’s old clothes, which I have to laugh at now because I know my daughter would be mortified at the very thought of putting on “boy clothes”. But for us, we were just proud to have what we had and I thought he’d hung the moon so I was proud to be following in his footsteps, even if it was just because I was wearing his old shoes. 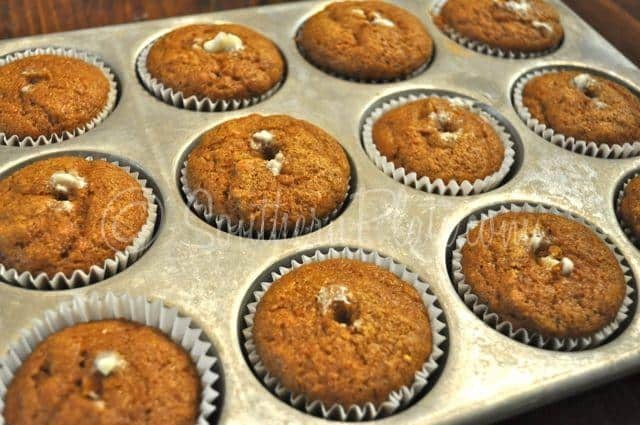 First, let me show you how to make pumpkin roll cupcakes. All the flavor and goodness of a pumpkin roll but with a lot less fuss. 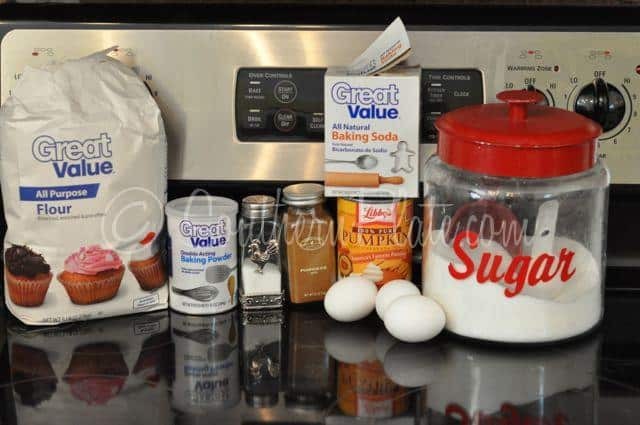 You’ll need: All purpose flour, baking soda, baking powder, salt, eggs, sugar, pumpkin, and pumpkin pie spice. Goodness gracious, this looks like a commercial for Great Value brand! The ironic thing is that I’ve gotten in the habit of shopping mostly at Krogers nowadays, mainly because the people are so very nice there. I love it when you can shop someplace and get to know folks. When you walk in the door and they say “Hi” and you know they recognize you. It just feels like a community. Like the good old days. I know a lot of the folks at my Wal Mart are very friendly as well, but with the size of the store and turnaround and such, it’s just harder to get to know people there. Just wanted to clarify that I like people at both places! 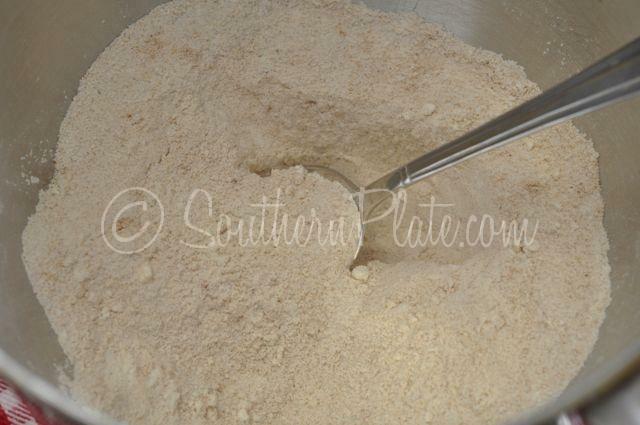 In a mixing bowl, place your flour, baking soda, baking powder, pumpkin pie spice, salt, and sugar. Okay, so basically just measure out all of your dry ingredients and toss them in a bowl. Stir that up with a spoon just to mix it up a bit. Now add in your eggs and pumpkin. And mix it up until well combined and smooth. Yes, it will be this horribly putrid orange color. This always looks like bad baby food to me, but I promise it will taste amazing. In fact, it tastes pretty dern good right now. Not that I want you to taste it, because it has raw eggs in it, and everyone knows that if folks taste anything with raw eggs they’ll keel over and die within the hour. So don’t do that. And just ignore that I said it tasted good in batter form because, you know, there is no way I could POSSIBLY know that without tasting it and with those raw eggs, had I of had even the smallest taste, I would have met certain doom and obviously would not be here typing to you now after doing such a reckless thing. Divide batter evenly among the cups of a twelve cup muffin tin, that has been lined with cupcake papers. Bake those at 350 for 20 minutes, or until the center springs back when lightly pressed. I stick mine in the refrigerator so I don’t have to wait as long. Patience is a virtue but I’m afraid it isn’t one I often possess. Now we’re gonna make our icing. This icing is the traditional filling for a pumpkin roll and you’ll notice that it doesn’t use near as much sugar as traditional cream cheese icing does, and I actually like that better. It still tastes plenty sweet though. You’ll need: Confectioner’s sugar, butter, a brick of cream cheese, and vanilla. Okay, you probably don’t know how I am about buying in bulk, but trust me, my husband (who recently had to load and unload six months worth of tomatoes and apple juice from my car) thinks you are better off NOT knowing how I am about buying in bulk. 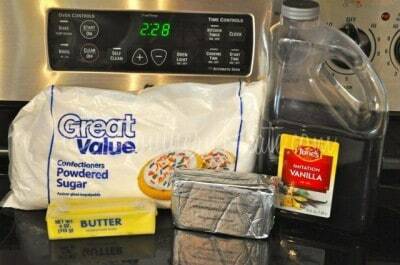 Toss all of your icing ingredients into a mixing bowl. You know a lot of recipes want you to add things gradually, sift things, and hold your pinky toes a certain way while making them. I’m not like that. Dump. Mix, Bake, Eat. If I’m gonna treat something with that great of care it needs to be cute, bald, have teeny tiny feet, and my last name. I have no idea where my final icing picture went. So just beat this up until smooth and creamy and then imagine a photo of it being all smooth and creamy. While you’re at it, imagine my house is clean, too! Alrighty, now we’ve got our icing mixed up and we’re ready to fill come cooled cupcakes. Note: You can TOTALLY skip this step if you want and just put a big old gob of icing on the top of these puppies. Half the time I skip this step, but I went the extra mile for you today on accounta I love you so much. What I do is get a gallon freezer bag and then I place a big piece of tape over one corner of it before snipping off the point. Insert whatever icing tip you can find, preferably one with a point on it, and you’re ready to go. Okie Dokie, now fill you bag with icing and seal it shut really well. Take the pointed tip and stick it down as far as it will go into the cupcake like this. Give it a good squeeze. Note: My plastic bag went kapoot after about six cupcakes and icing went all over tarnation. Clearly, some plastic bags are made better than others and clearly, if plastic bags were people I’d not be a very good judge of character. Some will end up with more icing in them than others but it is the thought that counts. Top each cupcake with a big dollop of icing and spread slightly. I think these are prettier if you leave a bit of the edges showing. Enjoy! I store these in the refrigerator. They’d be beautiful topped with a pecan half. Place 12 cupcake papers in a 12 cup muffin tin. 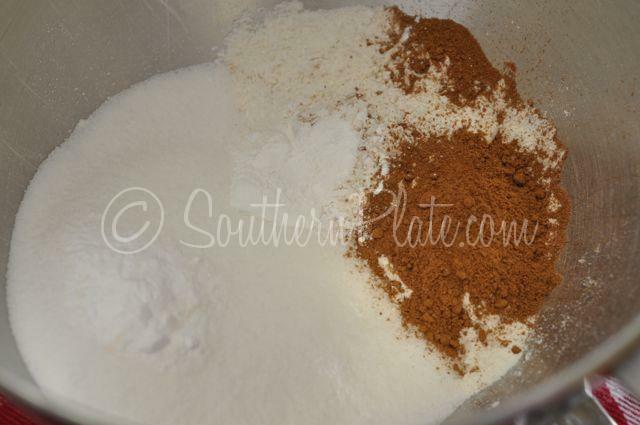 In mixing bowl, place sugar, flour, baking powder, baking soda, salt, and pumpkin pie spice. Stir with a spoon until well combined. 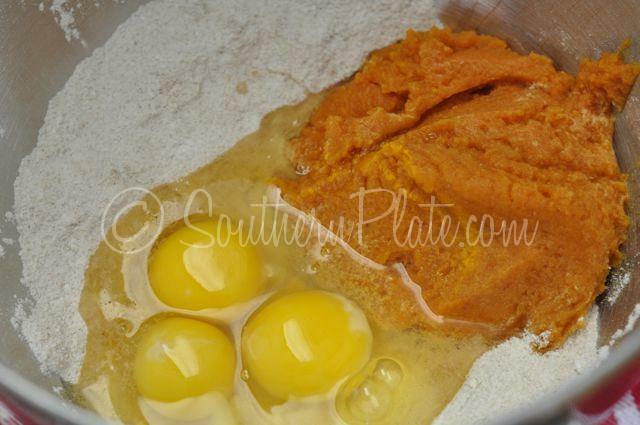 Add in eggs and pumpkin. Mix with an electric mixer until smooth. Divide evenly among 12 muffin cups. Bake at 350 for twenty minutes, or until center springs back when lightly pressed. To make the icing, place butter or margarine, cream cheese, powdered sugar and vanilla in a mixing bowl. 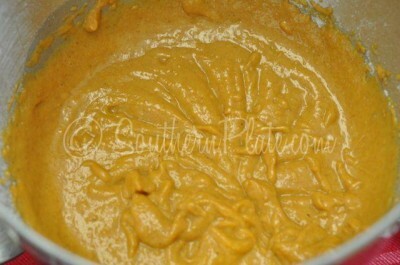 Beat with electric mixer until smooth and creamy. 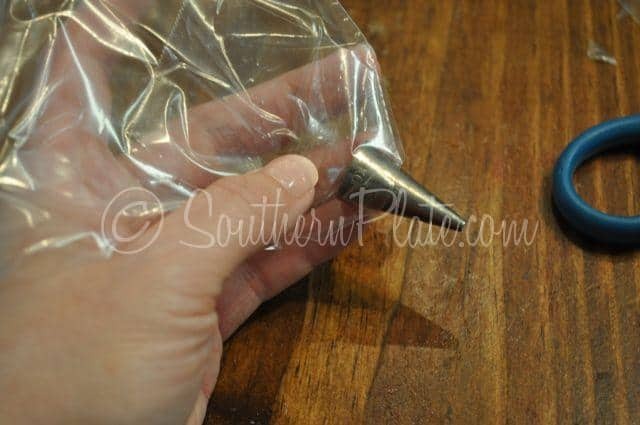 To fill cupcakes (Optional), place icing tip in corner of a freezer grade zipper seal bag (it is best to enforce the corner of the bag with tape beforehand). Snip off tip of bag so that only the very end of the icing tip is sticking out. Fill bag with half of icing. Press tip down into the center of each cupcake and give a little squeeze to fill. Repeat with all cupcakes. Spread remaining icing on top of all cupcakes. Store in the refrigerator. Definitely going to try this one! I recently made the Pumpkin Cranberry Pecan bread for our Worship Pastor and his family for their road trip to Florida. I left off the glaze since they would be in the car. Also made them some cookies and Rice Krispie treats. I made the bread last week for my parents while visiting them after my dad’s hospital stay. So good!! Fall is my favorite time to cook/bake! P.S. This is the BEST time to bake! Wooohooo! I MAKE PUMPKIN ROLLS EVERY YEAR AT THIS TIME….BUT THIS IS ABSOLUTELY FABULOUS CAN WAIT TO MAKE THESE!!! YOU’RE THE BOMB! Thank you so much Teresa!!!! I’m just lazy, lol! Yummy! Will be baking these soon! First, I love your blog! I am from Florence, so I feel “close” to home when I read your blog. I live in Tampa, (Florence will always be home, thought) and work at at a small college. Several of the students worship with us and when it is their birthday, I try to have some homemade treat waiting for them in the their campus mailbox. It is usally something from your blog! Three of them have birthdays this week…I think they will be getting Pumpkin Roll Cupcakes! I made a chocolate cake with peanut butter frosting about a week ago and before that, a loaf of banana bread. Both were for a good friend who I work with. She goes out to garage sales on the weekends, when she has time, and has been finding me all of these great “treasures” of nice work clothing and jewelry. It’s been great…almost as good as Christmas! All I can say is “Perfect”!!! What a delicious timesaver – with arthritis in my hands this helps me tremendously! Stupid question I guess, but can you just use self rising flour? yum! I miss Fall as a kid, it seems like we were ALWAYS outside, no matter how cold it was! Now I feel like I have to put everything I own in my closet on just to take the dog for a walk. Oh me….those were definitely the days. I had wondered how you were going to tell us to put the icing in the inside of the cupcake! You make this so easy! Thanks and can’t wait to try! You can also use a really big syringe if you have one, lol. Sometimes you can find great ones that are used to inject marinade in turkeys and such and they are fabulous for things like this! I hope you enjoy them Carrie!! I bake Yeast rolls for various members of my church in Byram, MS. Bread too. I have shared my recipe with many happy bakers. LOL Every Sunday they are waiting to see who gets rolls for Sunday dinner. 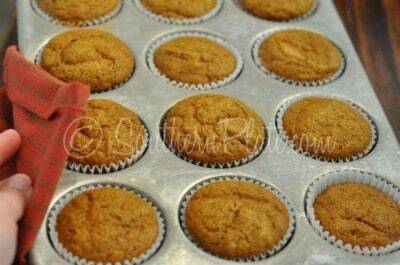 I love pumpkin desserts (breads, cupcakes, muffins, etc., etc., etc.). Can’t wait to try these!!! Well I made some of those amazing peach fried pies, and some peanut butter bars and my co-workers got some of those. 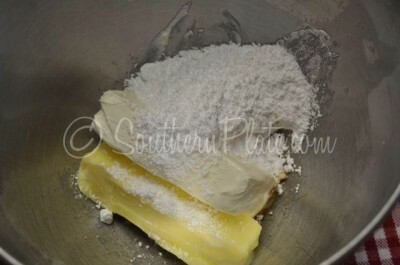 I’m making my Mom a buttermilk pie just ‘cuz. 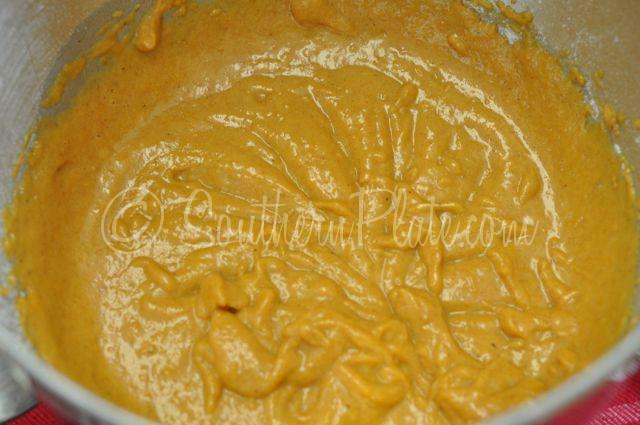 And some friends are having a wedding reception and I’m making some treats for that (banana pudding, buttermilk pies, peanut butter fudge iced brownies, red velvet truffles, and peanut butter bars), and every one of them is yours except one- and that one I got from Southern Bite! Ha- love you both! 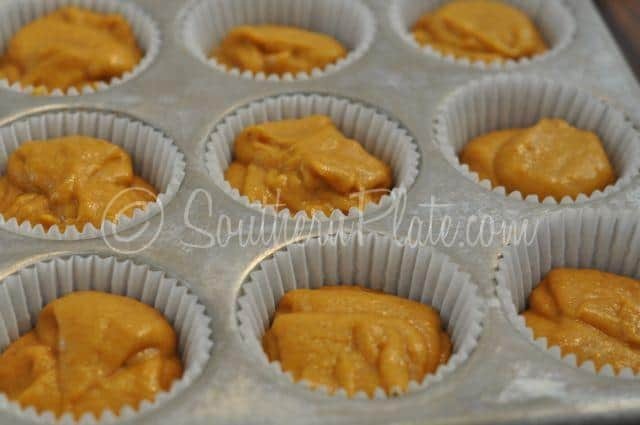 Not a big fan of pumpkin, but think I willl bake these for my sister-in-law (she likes pumpkin). I make Cream Cheese Pound Cakes for the ladies in my Sunday School Class on thier birthdays. Everyone should get a birthday cake, don’t you think? And so much of the time, women don’t get one unless they make it themselves. There are 23 ladies in my class so you know I am going to make at least 23 cakes each year and then some. I love cooking and I especially love baking for others…. My husband is a woodturner and belongs to a club that meets every month. I love to bake cookies, cakes, or cupcakes for him to take to the group. There isn’t usually much, if anything, left over to bring home. They have nicknamed me Mrs. Cookies. I have already chosen a fall-flavored cupcake to bake this month…spice cake cupcakes that includes pumpkin in the batter and cream cheese frosting….YUM! I can’t think of anything I would rather do than cook for my family and my friends! I baked 2 raisin pies for my Dad in the past 2 weeks. It was his birthday and all he wanted was a homemade raisin pie. I made one regular and one with meringue. Oh, Christy! A Southern girl should know that the cotton is not blooming now! It did that in early summer. The bolls are opening meaning it is ready to harvest. And it looks so beautiful around here too. I was in the East Limestone community recently and there are some beautiful fields there. I like our Kroger store so much. You’ll find me there on Wednesday because I’m old enough to get a discount on old folks day! The cupcakes look delicious. I made a Boston cream pie Friday night. Each month my two sisters and I take turn hostessing a full dinner. We all three live alone so sometimes our meals get a bit lackadaisical. We decided to have the monthly meal for several reasons. #1 It is a great chance to get together and visit. We reminisce, vent, and maybe a wee bit of harmless gossip takes place. #2 We fix seasonal dishes and always a special treat for dessert. 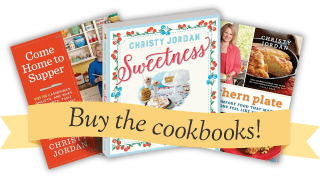 It is a great chance to try a new recipe or an old childhood favorite. #3 Calories don’t count at this meal and it is exclusively for us. #4 We have no rules except that it is NEVER a competition. It is purely for fun and it does not have to be lavish or expensive. It can jusrt be something the hostess has been hungry for or something not very feasible to cook for just one. We all look forward to our monthly dinner and it has no certain date-just once a month that suits us all to be present. Incidentally, we call this our Golden Girl dinner and oddly enough we are all three different enough that we closely fit the characters. If you are not lucky enough to have sisters yuo might find a few great friends to share in this. Trust me-it will become a highlight in your month. Just made your chocolate cobbler for my Mom’s birthday! YUM! I see your can of pumpkin, but don’t see it listed in the ingredients. How big is the can? I tend to use “fresh” pumpkin more as the pumpkins get cheaper as fall moves along! I’m baking a chocolate cake right now–we were just invited to dinner with another family, and I’m bringing dessert. The cake requires 1 cup of hot coffee, and it is the moistest chocolate cake ever! That cake sounds right up my alley! The pumpkin is listed in the ingredients right above the icing ingredients. 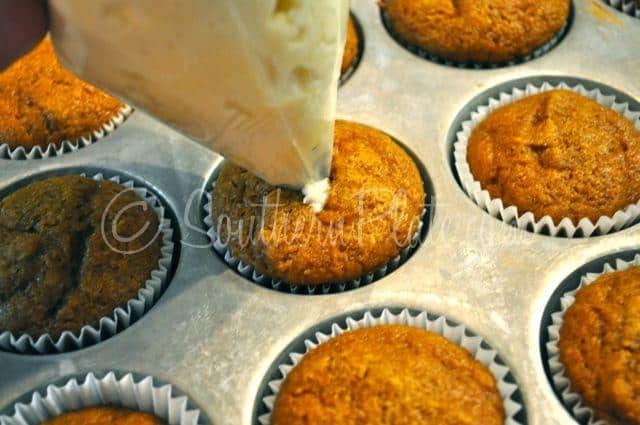 Another way to get the icing inside would be to take a wooden spoon poke a hole in the top of the muffin then take your icing bag with big tip (like a big shell #6) squeeze the icing into the hole and then swirl it around the top of the muffin. Hubby got called in to work on Saturday, and I sent him with a batch of oatmeal muffins and a jar of (your recipe!) apple butter. He said it was gone in a flash. My aunt is famous for her pumpkin rolls, but we live too far away now to enjoy them. We Weill definitely have some pumpkin roll cupcakes this week. I hope y’all like them Jenny, you will have to let me know what you think. Admittedly my Yankee upbringing has left me without certain key Southern things in my recipe box (like a family recipe for macaroni & cheese)… but what is a Pumpkin Roll?? Think of a cinammon roll or jelly roll but add in pumpking filling instead. Love your recipes!! Southerners sometimes don’t get the recipes you find in magazines and such, but you cook like I do!! How would this work with sweet potatoes? We tend to prefer them over pumpkin. Would there be many changes? I think it would work just fine Christie, I can’t think of any changes. Let me know how it turns out. I have not even read the recipe yet, but I know I am going to make these right real soon! Just reading the title and seeing the cupcake made my mouth water! Thanks Christy for all the great recipes! I hope you like them Vette!! Thanks for posting this recipe! I will be making these soon. I am baking brownie bites for new neighbors right now. I saw their tags say Texas, and I moved here from Texas and when I did I got 2 people coming over introducing themselves. I want my new neighbors to think Alabamans are more personable and friendly than I (still think) thought they were when I moved here. You are such a great neighbor Misty, they are going to be blessed to have moved in next to you!! brothers shirts. We raked up pine needles and jumped in them. Only problem is sometimes we got red bugs…yuck, but it was fun while you were doing it though. Your cupcake recipe sounds great. 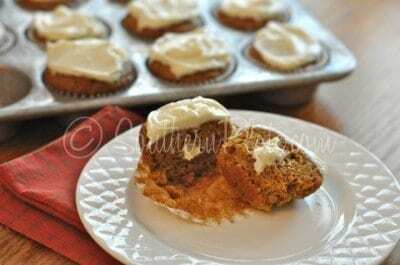 Anything with cream-cheese icing…..delish! Wonderful memories Laurie!! I hope you like the cupcakes!! These look so good..I cannot wait to make them! My daughter and I made an angel food cake and root beer float cupcakes just because.. I hope you enjoy them Dixie! !